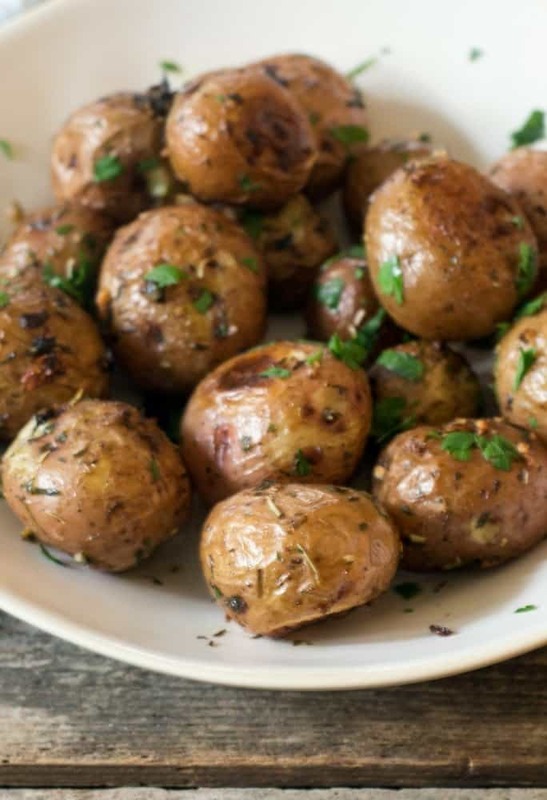 These Garlic Herb Roasted Red Potatoes are a quickly prepared side dish. I particularly like using new potatoes for this recipe, as they are small so no cutting is needed for the potatoes. 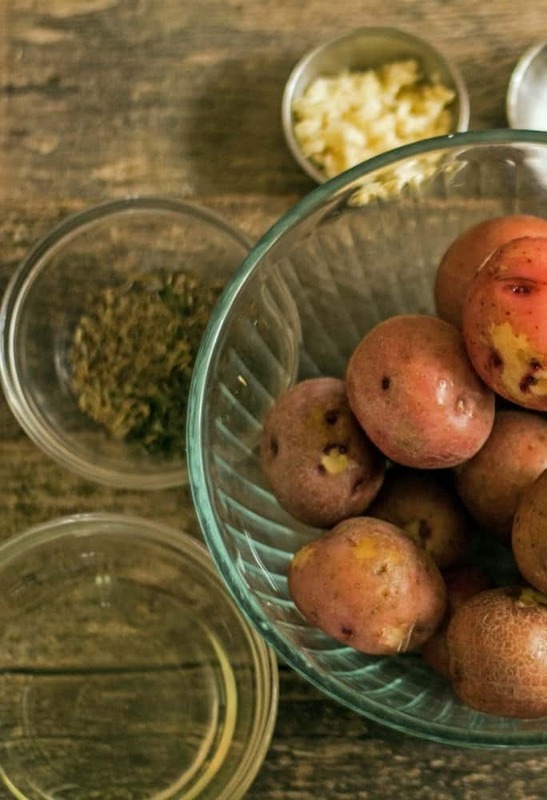 Simply scrub your potatoes and prepare the dressing and the red potatoes are ready for the oven. 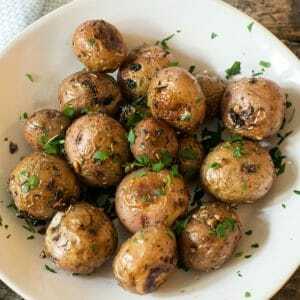 These Garlic Herb Roasted Red Potatoes have been family favorite for years! They are so easy to assemble and they are perfect for any night of the week! Even better, they are a perfect side dish for a family gathering and Holiday celebration! These are always a staple at family parties. They are easy to make ahead of time, re-heat really well, and a big plus, not expensive to prepare! The herbs in this dish can be flexible. For this dish, I used parsley, tarragon, and thyme. Feel free to use other fresh herbs you have handy. In a pinch, I have used dried herbs. I like to use either olive oil or grapeseed oil. You can also vary your personal choice of oil. I use 2 Tablespoons per pound of potatoes. These potatoes are an easy make ahead side dish! Reheats easily and perfect for feeding a large crowd! This is an awesome side dish for dinners and I have also served this at Brunch! These Herb Garlic Roasted Red Potatoes pair well with many dishes. Some of my favorites if you like this at brunch would be Spinach and Mushroom Frittata, Apricot Bourbon Maple Glazed Ham, and a nice beverage for the brunch should be How To Make The Perfect Bloody Mary. 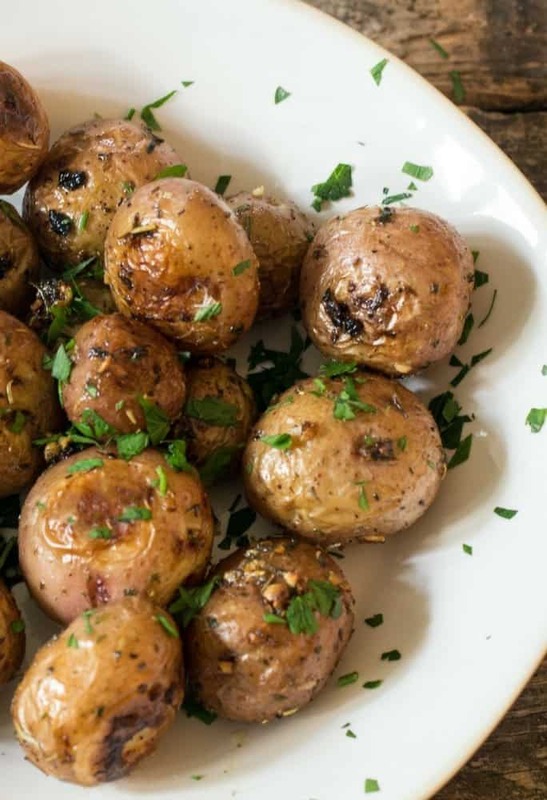 Pin these Herb Garlic Roasted Red Potatoes to your favorite Pinterest board HERE! Scrub the red baby potatoes. Pat them dry. In a medium bowl, combine the olive oil, chopped parsley, tarragon, thyme, minced garlic. Add salt and pepper to taste. Add in the red potatoes and coat the potatoes completely with the herb mixture. Feel free to adjust the herbs as to what you have available. We had these last night with a steak! Super easy and delicious! I’m so happy you enjoy these potatoes! They do go great with steak! I do like roasted red potatoes. These look delicious here, I’m anxious to serve them as a dinner side to my beef! That sounds great, I hope you like enjoy! Let me know how the dinner came out for you! I love roasted potatoes but I often add way to much oil and they are not as crispy as I would like them to be. I am going to try your recipe. I hope you enjoy the recipe. I use very little oil, these are crispy, enjoy! I haven’t had roast potatoes or red potatoes for such a long time but I am craving them now this looks delicious! That looks delicious. I have not tried using grapeseed oil for cooking. It sounds interesting, I can’t wait to try it. That looks so good! I must try it. Roasted potties whether sweet or plain love it these potties are small enough for side dish with chicken thanks for sharing. You are very welcome! I hope you make these as a side dish! I love this one because it is healthy and easy ! Oh my goodness, I think this is yummy, haven’t tried it, but it would be perfect for my family. Potato is my all time favorite. Thanks for sharing this. Exactly, healthy scrumptious and quick to prepare, doesn’t get much better than that! It looks so good, I love potatoes. And it so festive too, it’s perfect for the Holidays! These are perfect for the Holidays and very easy to put together! This is my husband’s favorite potato dish when we go out to restaurants. I am going to try your recipe and surprise him with it this week. That is great Pam! I hope he enjoys the surprise! These are so quick and easy to prepare as well! Yum. These sound great. I love red potatoes. I never though of using grapeseed oil on potatoes! We are big potato lovers in our house, so we gladly try new potato recipes. And baby reds are some of our favorite! Especially since we started adding them to my husband’s yummy Thai soup. They really soak up flavors so well. I really glad you like this recipe! Baby reds are awesome and quick to cook. Thai soup and red potatoes sounds really great too! I’m a huge fan of oven-roasted potatoes. I love how the recipe allows the herbs and potatoes to shine rather than be overpowered by other sauces or flavors. I’ve also never used grapeseed oil so I want to try that sometime! Excellent Isabel! These are one of my favorite ways to raost potatoes! Grapeseed oil is a nice alternative to olive oil! I am so glad you like the recipe! Looks yummy! I’m going to make this for Sunday! Awesome Shantel! These are one of my favorite ways to prepare potatoes! Get the carbs and still a healthy side! Enjoy! You are very welcome- enjoy! Mmmm… yummy!! I love roasted potatoes. These look great! Thank you Deirdre – I hope you enjoy!